I did it! I finished my thankful mini-album last night. Given that this has been kind of a hard week and that I haven't felt great, that's an amazing thing indeed. I am so proud of myself! Thought you guys might like to check out how the finished product looks. Go me!!! Remember the cover? Here it is again in case you forgot. I think I added a couple of embellishments on the cover, plus I added the ribbon at the top. Notice how you can see some things peeking out from the sides and bottom; I really wanted to have more of that when you looked at the album from the outside. 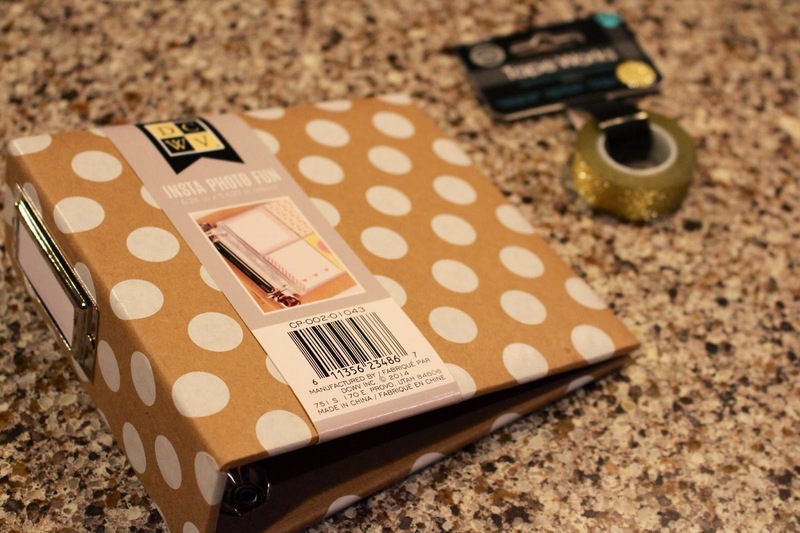 The cover has patterned paper, doilies, a popped up PL card, some gold stars, and some stickers to indicate the year and thankfulness. 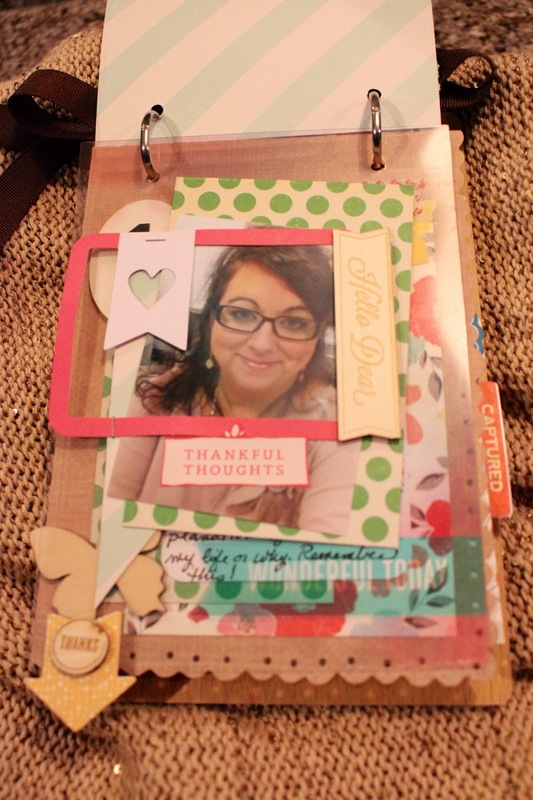 The title block has October Afternoon letter stickers and a ticket embellishment to invite the reader into the album. Here's the cover page. It's a transparency sheet that came with the album. 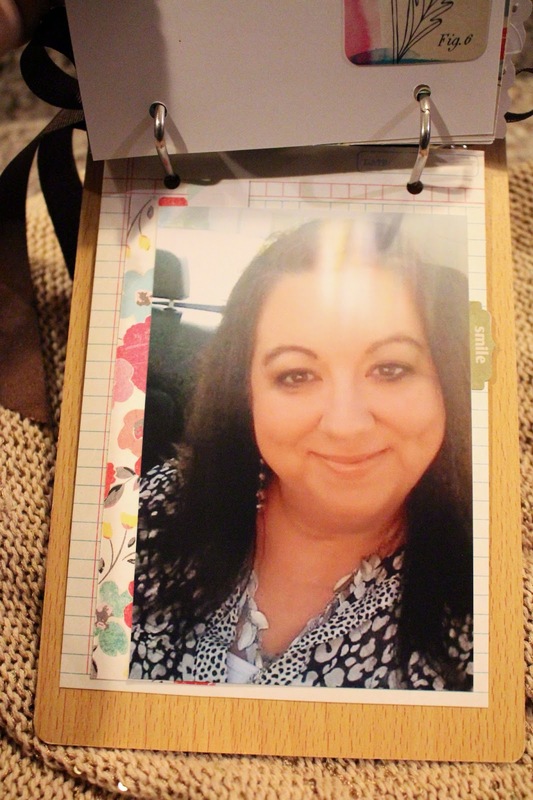 I layered papers and embellishments on it and included a pic of myself since this is an album about the lessons that I'm thankful to have learned. I included a WRML overlay PL style grame, a Studio Calico wood veneer, a Dear Lizzy sticker, and patterned paper to ground it. This patterned paper is repeated regularly throughout the album. The arrow sticker at the bottom hangs off the page and has a wood veneer thanks on it to direct the reader to keep flipping pages. 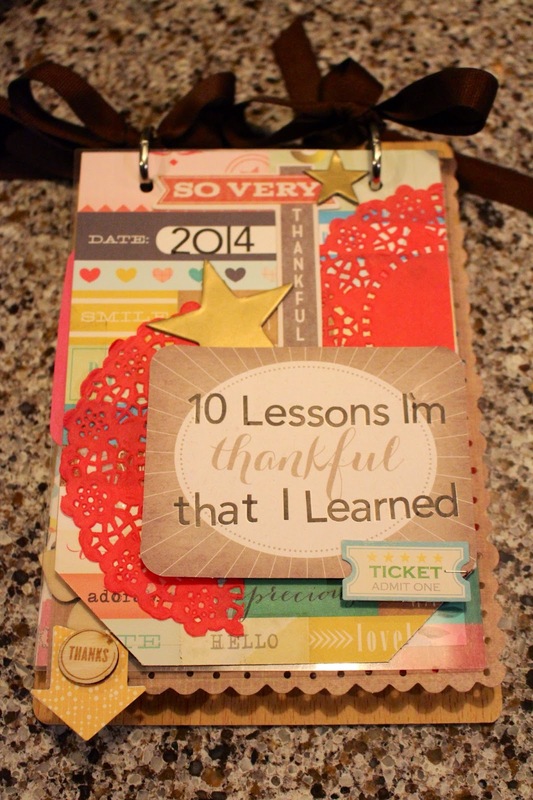 The next page starts my list of ten lessons for which I'm grateful. 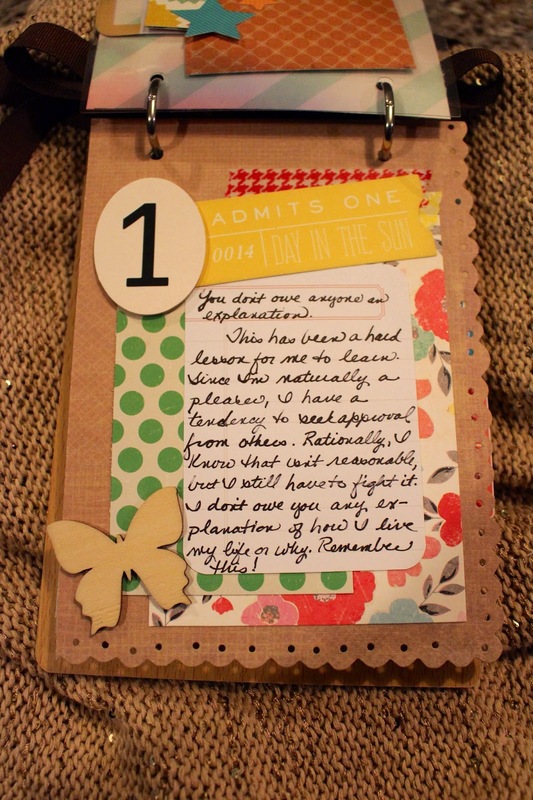 I didn't add much to the base page that I already made, just the journaling and the wood veneer butterfly. The page at the top just has some patterned paper on it and some layered star stickers to cover up the adhesive and stuff on the back of the transparency that came before this page. 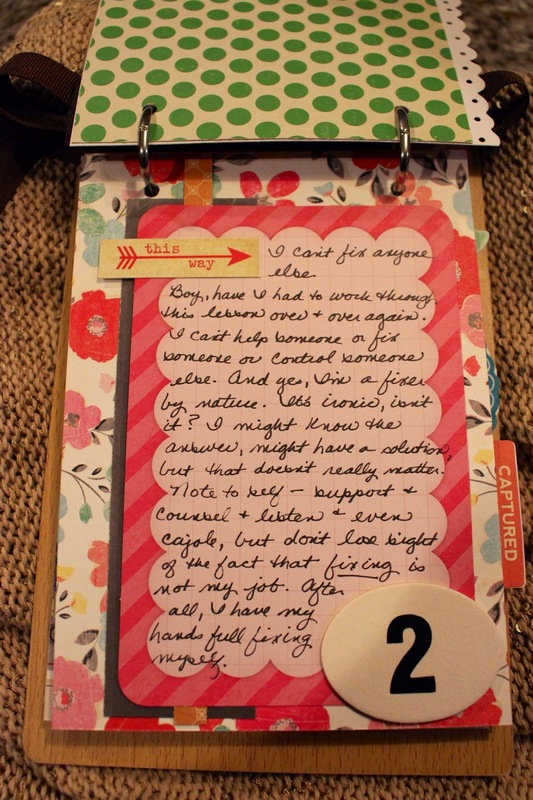 These two pages only saw the addition of journaling and a sticker for each. Sometimes simple is good. Plus, I have a lot going on in patterns here, so I didn't want to have too many embellishments. 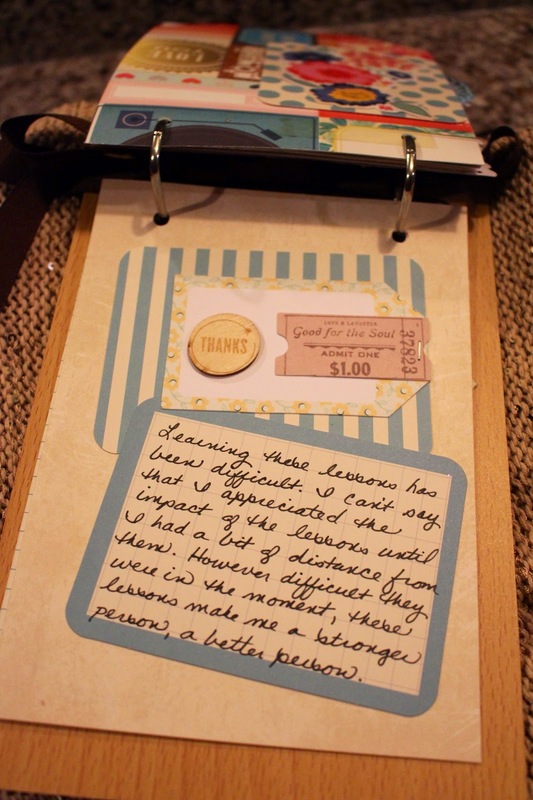 On this page, I tucked some of the scalloped edge paper beneath the journaling card. Everything else was part of the original base page. 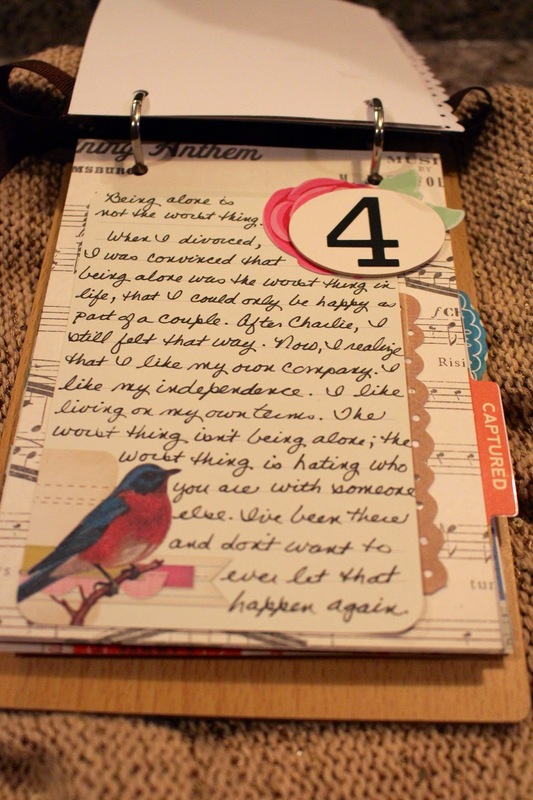 At the midway point of the album, I broke up the journaling pages with another selfie. I added a strip of paper to the left side with a me sticker and a couple of stars and a heart. I also added a Jillibean Soup tab to the right side. A simple sticker was all it took to finish off this page because I wanted the focus to be on the words. The only other embellishments are part of the number block that I built earlier in the week. The word Story was really all this page needed to set the stage for it to be about most people wanting to be heard. 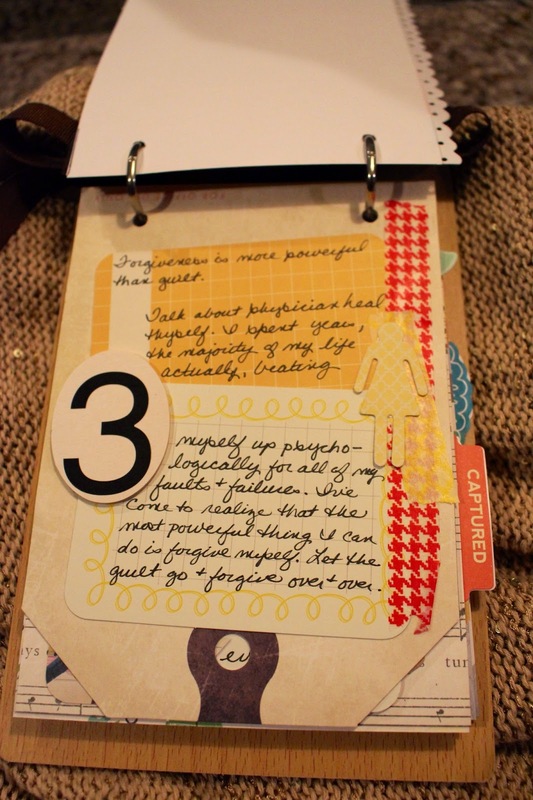 I liked how that was a subtle way to tie my journaling and the title of the page together. 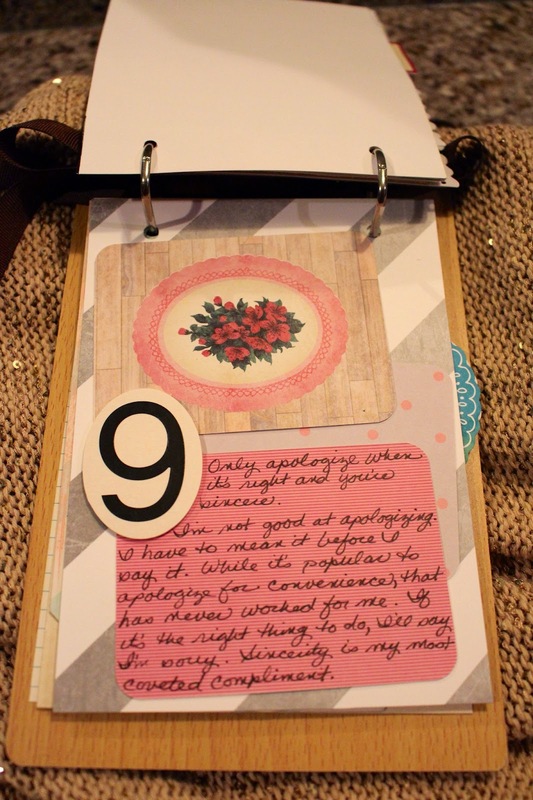 Rather than having it out there for everyone to read, I put this journaling in a small pocket. It's not that it's really secret or anything, I just thought it was a good way to vary the look of the pages. 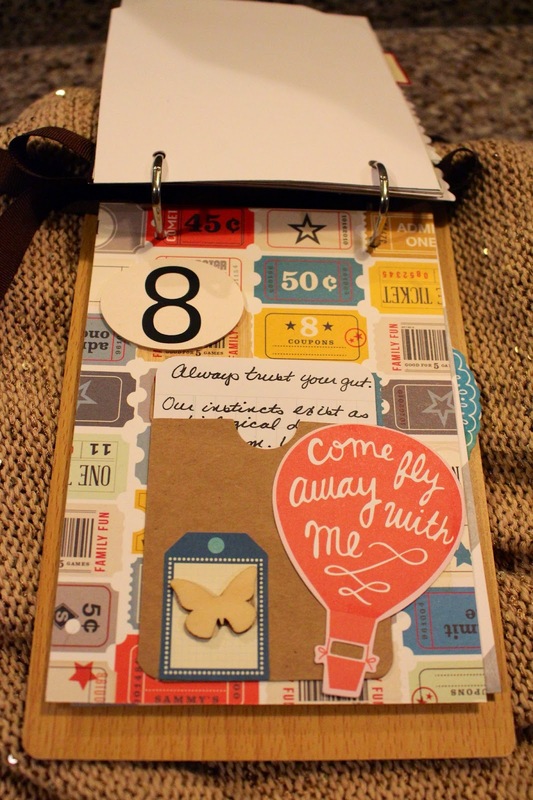 The hot air balloon and the wood veneer butterfly again support the fly message in a subtle way. I left this page alone. Since there are multiple patterns going on and a handful of colors, I thought it best just to leave it alone as is. 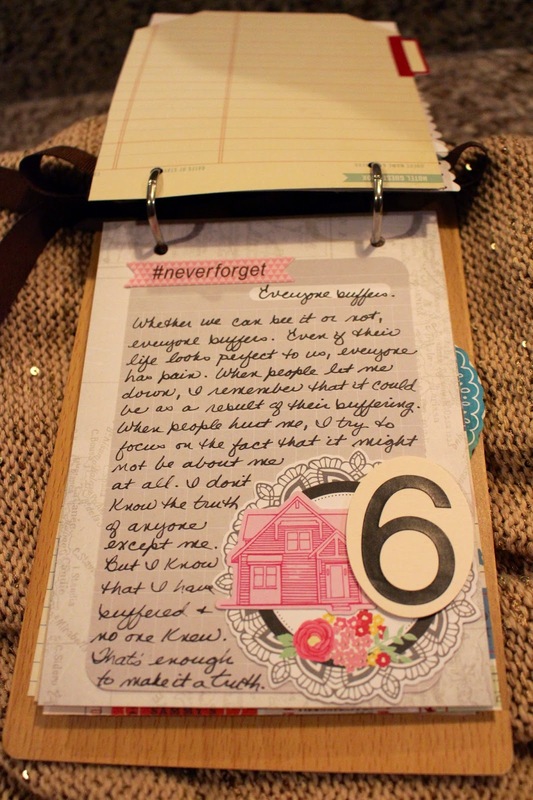 I also didn't really have any embellishments that went along with this particular journaling, so I didn't want to force something that didn't really fit. This was my last thankful lesson and probably the one that was most painful for me to learn. I didn't want to overdo the page, but I did add a white man and woman sticker as well as a chipboard sticker that I let hang off of the page a bit. 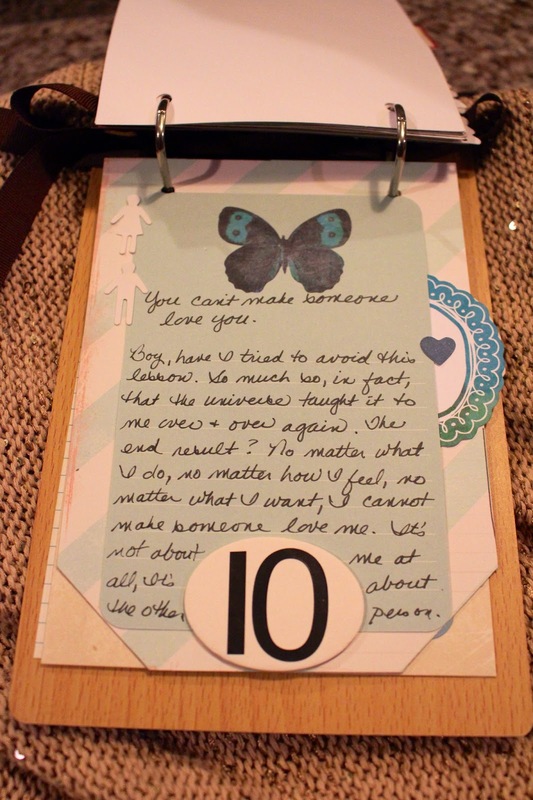 The blue heart in the chipboard piece picks up on the blue of the butterfly on the PL card. I felt like I needed a summary page at the end of my list of ten. 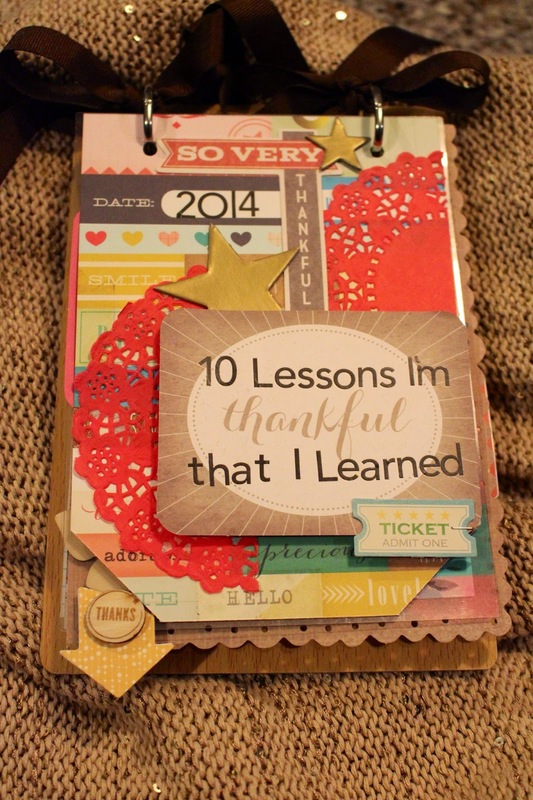 The top card has a wood veneer Thanks and a ticket layered on top of a tag while the bottom card summarizes how I feel about those ten lessons in general. For the last page, I finished with another selfie that has a softer look because of the way the light is shining on me in it. I layered a couple of strips of patterned paper under it to tie it in to the tag that shows on the top as you turn the prior page over. The little tab on the right hand side just felt like a good finishing touch to me. 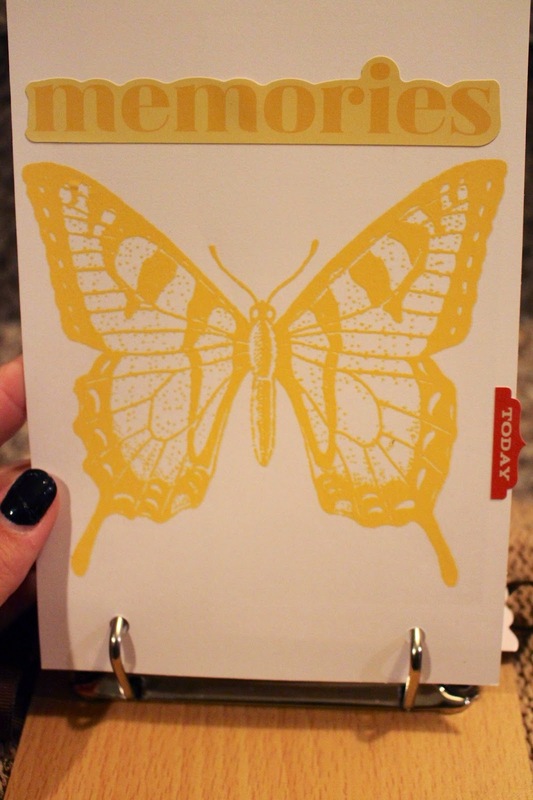 The closing page is made up of a rub-on butterfly and a sticker title. Again, the subtle message of the butterfly has carried throughout the album as a way of showing that I've grown and changed. Here's what the finished album looks like from the side. And here's another look at the album in its finished form. I think this is one of my favorite minis that I've ever made. Shocking, right? 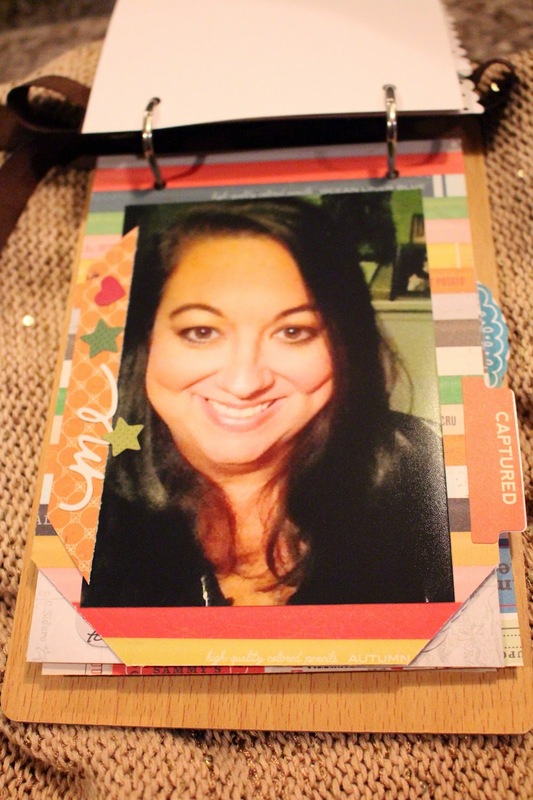 It just came together really easily, and I had a lot of fun layering the embellishments and paper for each page. Relaxing and fun - that's the way minis are supposed to be. Finally, this is where the album is going to live on my coffee table for the next couple of months. After that, I'll put it in my cabinet with the other mini-albums I've made. Great lessons! The mini looks great; I love all the layers. 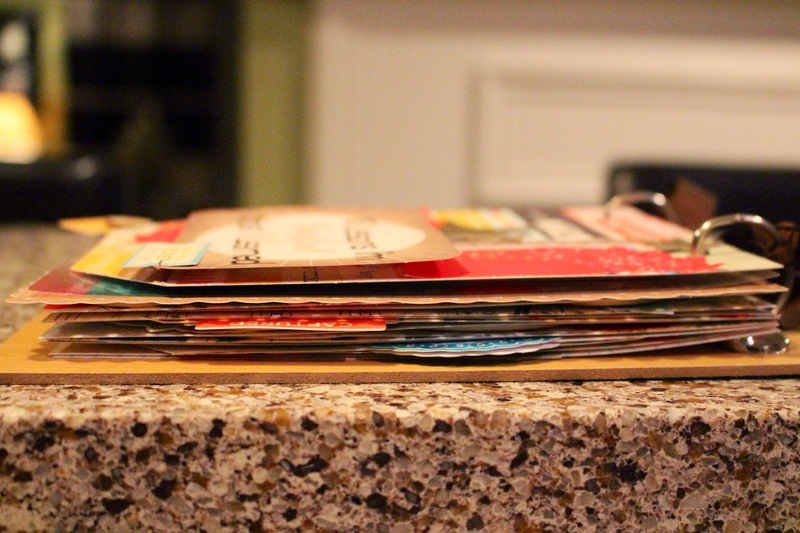 love the layers & pages with things extending past the edges! great theme for a mini! 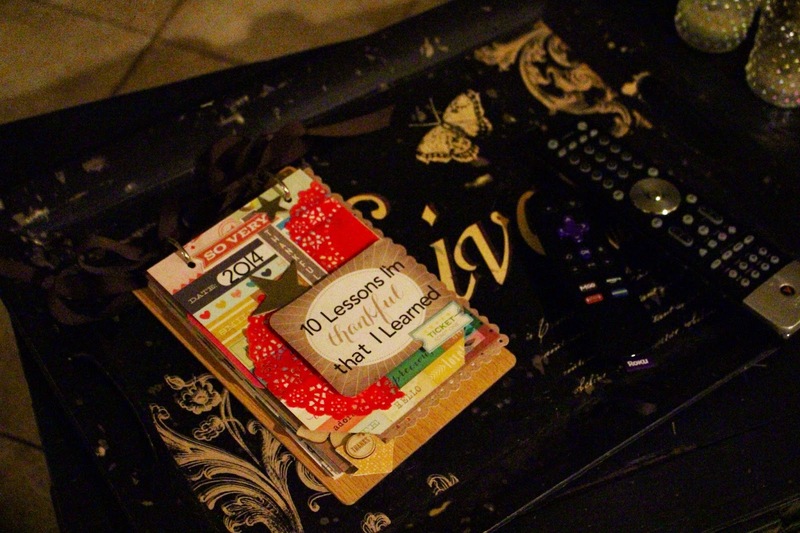 I love the layered look of this mini and the honesty & wisdom of your hard-won lessons. 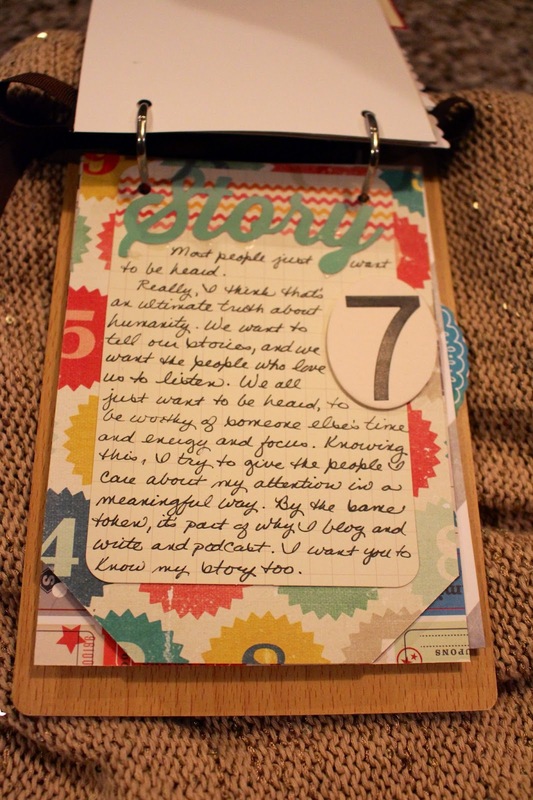 This is a great variation on the November gratitude project. Love it!!! So well done and inspiring.